Join us for a free presentation to learn more about the popular online marketplace Craigslist! 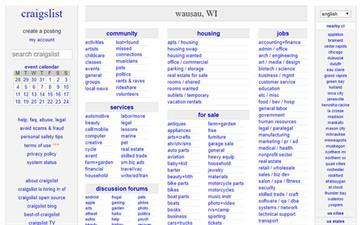 We'll show attendees how to navigate the many different aspects of Craigslist, which is a free, online version of classified ads. Users can buy and sell items, post job openings and search for jobs, find housing or sell property and more. This program will cover some of that, as well as tips for avoiding scams and frauds, and we'll have time for questions. Open to the public, but space is limited so registration is required. Call 715-261-7230 to sign up or for more information.